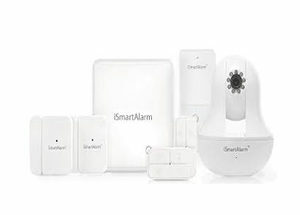 The iSmartAlarm Premier Home Security package is a wireless and affordable alarm system that has all of the essential features that you need for a safe home. With this wireless device package, you can monitor your house down to a door, window or cabinet opening. You can specify the area you want to observe and stay aware of any movement instantly with the easy handheld controls. The iSmartAlarm is both iOS and Android compatible and features an HD camera. The smart alarm system also connects with Amazon Alexa. With this smart system, you can get an instant push notification and quality images from your home to wherever you are.